Hi friends 🙂 Sorry I’ve been slacking on posts this week! I was without my darling husband/photographer for a week and now he’s back (yay!) but we’re both playing catch up from wonderful, long Christmas vacations. Hopefully I can get back to my every-other-day schedule ASAP. I am not usually a fan of graphic tees or novelty sweaters, but I had been eyeing this J. Crew heart sweater and similar options for a while. Thankfully Santa took note! 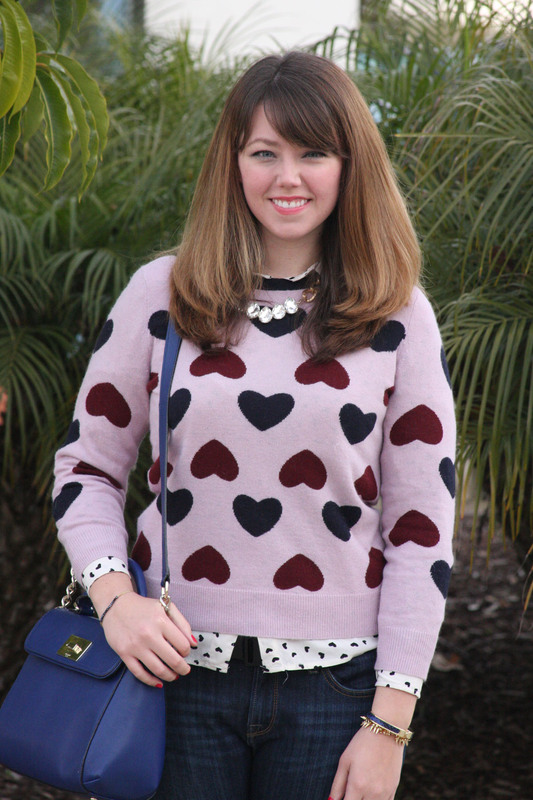 Since you all know my penchant for print mixing, I paired it with more hearts! Posted in Outfits and tagged Ell & Emm, Everyday Sparkle, Forever 21, Hearts, J. 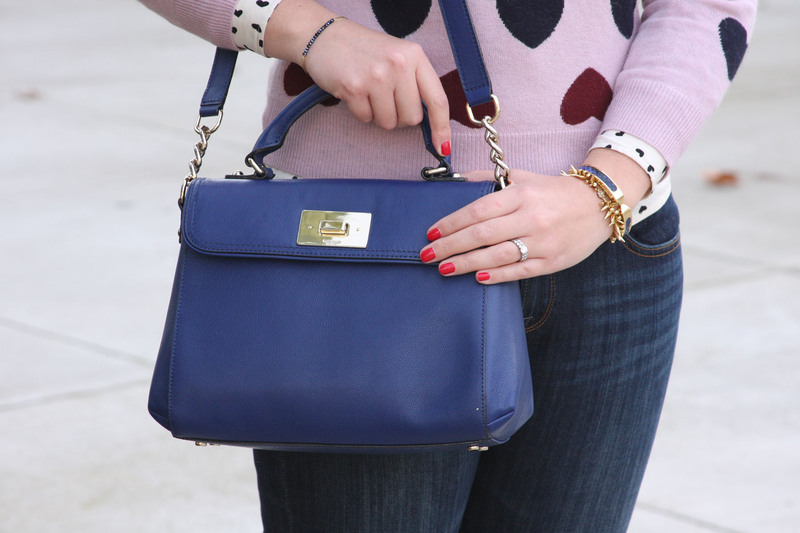 Crew, Kate Spade, Lucky, Navy, Print Mixing, Stella & Dot. Bookmark the permalink. I’ve seen many posts about holiday party dresses (including some ideas of my own here), and I’m planning to share my office holiday party dress soon. But not all holiday parties are cocktail dress attire. You may have an office holiday luncheon or other daytime event. Dressing for such an occasion can be tricky. You want to get in the holiday spirit, but how do you toe the line between festive and over-the-top? Today’s outfit is one I would wear to either a daytime work holiday function, or maybe an event immediately after work. The basic pieces are classics–a tailored skirt, crew neck cardigan, tall black boots, and a mess of pearls. The glittery thread of the cardigan and holiday color combo make it seasonally appropriate (although I would wear this other times of the year, too). What do you think? 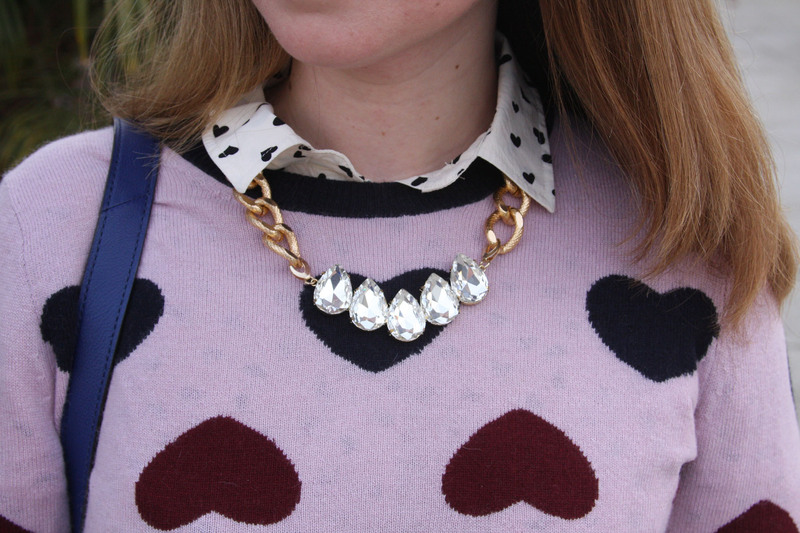 How are you dressing for more casual holiday events this year? Posted in Outfits and tagged Everyday Sparkle, Express, Holiday, J. 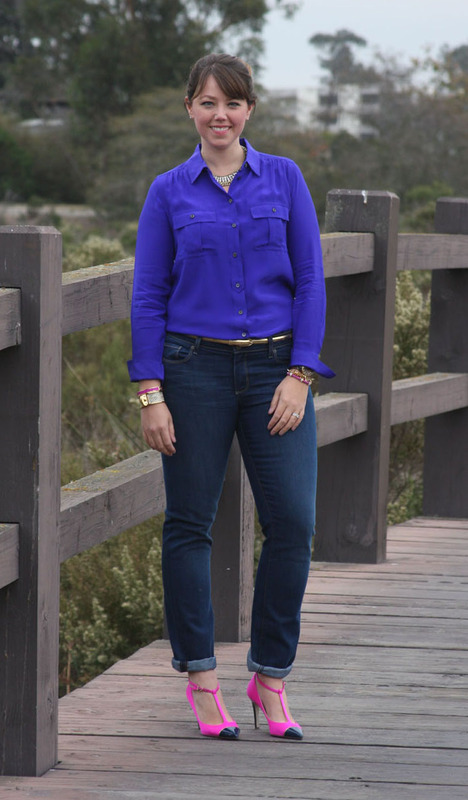 Crew, Old Navy, Stella & Dot, Stripes. Bookmark the permalink. I’m embracing red and green in today’s post, with my sequin sweatshirt (last seen here) to add additional holiday flair. I think it works since the blazer is kind of orange and the bag is really bright–not your traditional holiday red and green shades. Or maybe it doesn’t work at all. Who cares, it’s Christmas! 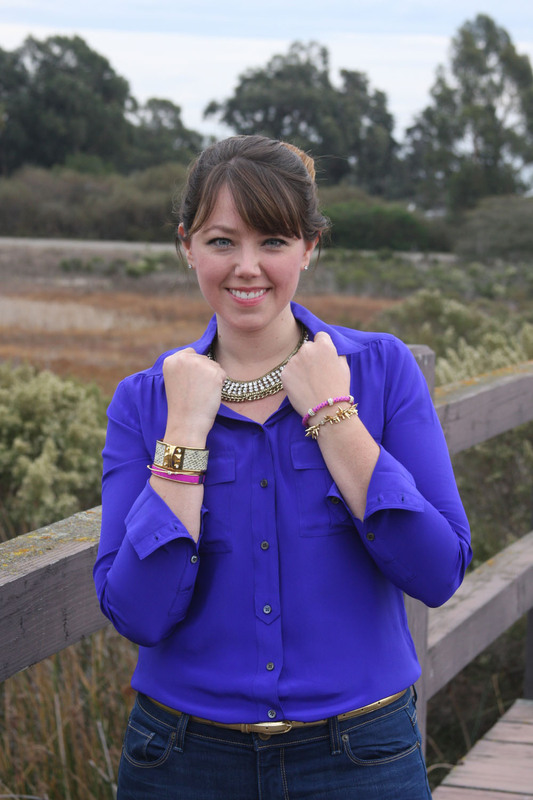 Posted in Outfits and tagged Anthropologie, Everyday Sparkle, H&M, Holiday, J. Crew, Sequins, Stella & Dot, Target. Bookmark the permalink. Guess what comes after Thanksgiving? Holiday parties! I’ve started thinking about what I’m going to wear to my office holiday party. I will probably wear something I already own, but it’s always fun to look 🙂 Whether your party is with friends, family, or coworkers, you’ll need something pretty to wear. Here are a few lovely dresses to give you ideas. It’s hard to go wrong with lace or sparkles! If you don’t have the budget for a new dress, try fun tights or a statement bracelet to update something you already have. It’ll feel brand new! Do you have any holiday parties to attend? What are you planning to wear? 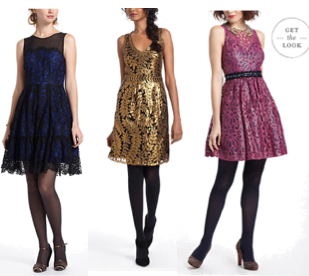 Posted in Outfits and tagged Everyday Sparkle, Holiday, Lace, Party Dresses, Sequins. Bookmark the permalink.